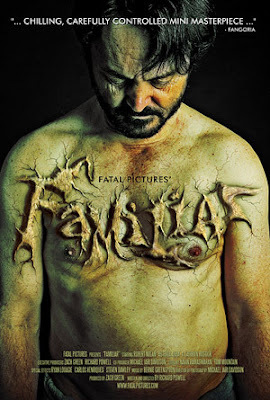 FATAL PICTURES: More Horror Review's "FAMILIAR"
What can you really accomplish in 24 minutes? Really, there’s not much. You can make some breakfast, maybe, or possibly get started on some errands, but you’re not going to get much done. And you’re not going to wind up ahead when the time’s up. But if you decide to put in Richard Powell’s Familiar you’re going to accomplish one thing for sure. You’re going to get creeped the hell out. Familiar is the latest short from Fatal Pictures written and directed by Powell. In it, we follow Robert Nolan as John Dodd as he goes about his very mundane life. We get to see inside his world via an almost melodic voice over that is warm enough to be inviting but also acerbic enough to keep us on edge. We see Dodd as he eats with his family, and watch as he expects their every move. It’s not a life all that different than any of ours, at least not until his wife gives him news that pretty much ruins his plans for a happily ever after. The news is too much for our mild mannered main attraction, and Dodd does what he feels he has to. That’s when Familiar realizes that you have it all figured out. You know where it’s going, and you get a bit complacent as the jaded viewer who’s seen it all. Read full review here.